Still at Mom's. She is doing great! I still have to remind her sometimes not to pick up something heavy or lift her arm over her shoulder, but she's getting there. This is a time when no pain can be a hindrance. Tomorrow we go to see if the drain comes off. If it does, my nursing days are over. Thank you so much for all your best wishes, concern, prayers and thoughts for us. They are most appreciated!!! Here is the 7" Anna's Garden block I have been working on. 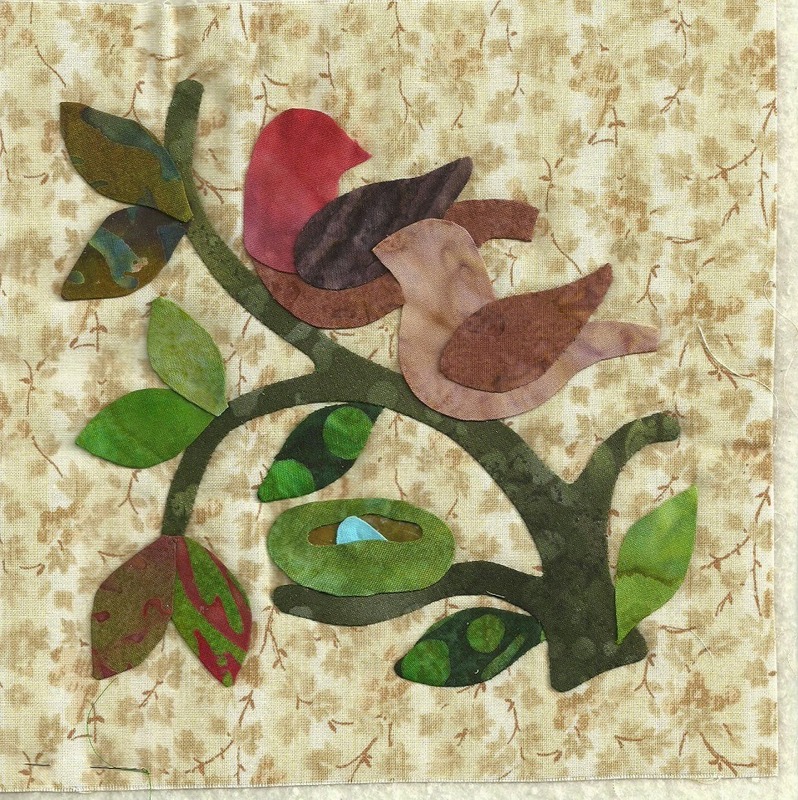 I brought this block because it is the smallest and most portable of my applique projects. Half is is now stitched. Here at Mom's I decided to add all the other pieces that needed to be prepped. I began with the nest. The inside of the nest is reverse appliqued and I then made the egg. Somehow it was too big! So I had to keep making it smaller to make it look to scale with my pair. I find my pieces grow as I trace and cut out. I've had to keep reminding myself to cut inside the pen line so they will stay the right size. Next I added the leaves. I had very few choices of fabric with the leaves. The block now has all the pieces fused in place. I would start on the stitching, but I didn't bring thread that will work with this fabric nor invisible thread. I'll save this for Slow Sunday Stitching. I wonder if Kath will be doing it next year. What are you working on? Would love to see your eye candy. Leave me a comment and I'll come for a visit. Happy New Year this Thursday! I am mainly working on quilting but getting in a little applique as well, glad your mom is doing better! Glad your mom is feeling better, you must be taking really good care of her! Love your applique. I'm working on a log cabin that I really need to get finished before I lose interest. 169 blocks of anything just might be too much! Happy New Year!! I want to get back to more hand applique and embroidery this year. For now, I am enthused about lights and inspiration to be found in the colors around. I'm actually working on my daughter's quilt. One of my goals for 2015. Have a nice day! 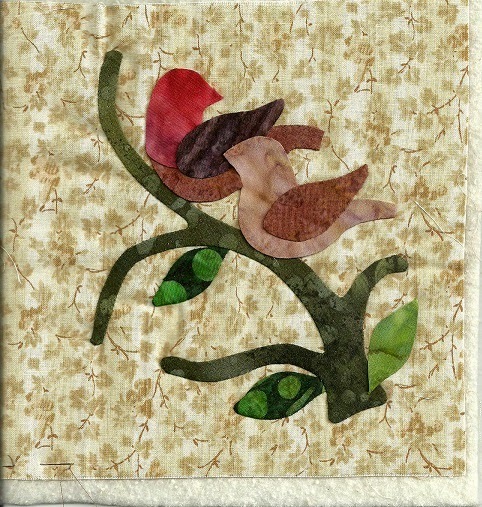 I just love birds in appliqué and this little block is sweet. I have just finished appliquing a big block for my Rachel Meyer quilt and will spend today with some simple machine piecing. Glad to hear mom is doing good and your appliqué is BEAUTIFUL. Hope it all goes well at doctor. Good news about your Mom. Loving your applique Angie....so sweet. I love your bird block, and that you got to do some applique, AND that your mom is doing well. Here's hoping the drain comes out just fine! I'm working on the embroidered part of 3 Sew Sweet Simplicity blocks - really slowly! such good news re Mum. 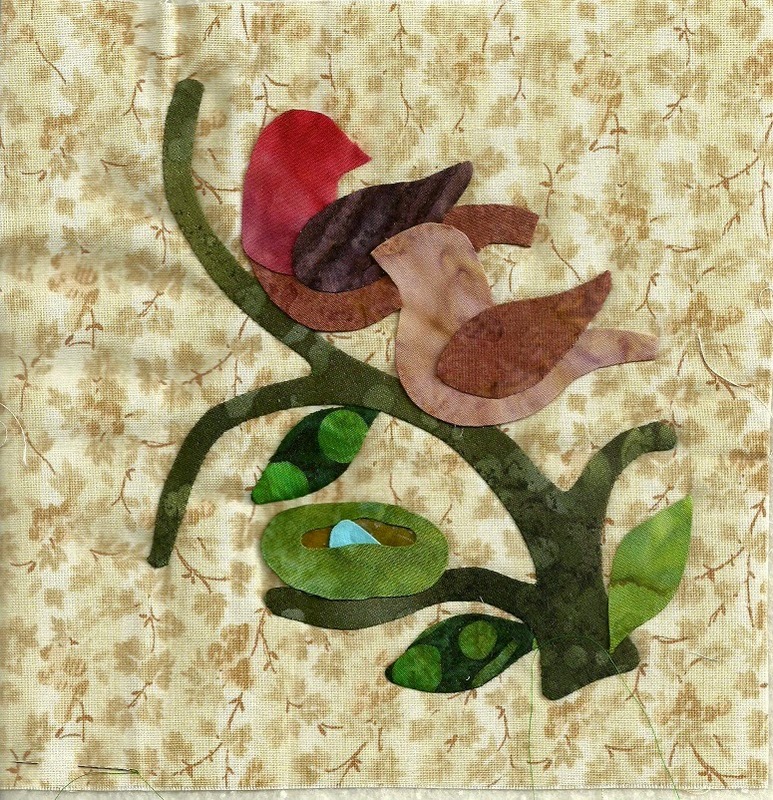 Applique is beautiful, anther technique I hope to try soon. I am about to finish a crazy wall hanging but so disappointed with it made a right mess of sashing so now it is out of shape so do not think it will be going on my blog! A very sweet block ( or maybe I should say a very tweet block, lol!). Do you hand appliqué the fused pieces? I am taking a machine appliqué class at my LQS right now. I also do needle turn appliqué by hand. Glad to hear that your Mom is feeling better. Love your applique! Beautiful!